US$ 1230 / person ? 1 Guwahati – Samdrup Jongkhar – Tashigang Early morning in 5 o’clock you will be picked-up in Guwahati, driving to Samdrup Jongkhar. Here you will meet your Bhutanese guide and driver, who will manage all immigration formalities. Then you will start all day drive ascending to the Himalayas. After few hours drive we will stop to get blessing from Hindu hermit for safety of our journey. Soon after you will have opportunity to visit first of many charming Bhutanese Buddhist temples, called Zangto Pelri Lhakhang, with detailed mural painting. During afternoon you will stop in Khaling village to visit National Handloom Development Project, which maintains rich tradition of local weaving. Also you will pay a visit to the National Institute for the Visually Impaired. One of the accomplishment of this progressive institution is the development of Bhutanese version of Braille's script. Along the way, you'll also pass by Karma Thegsum Dechenling Goemba, huge monastery school and Sherubtse College, first Bhutanese university campus established in 1978. Also we visit temple in nearby Kanglung village. Reach to Tashigang. 2 Trashigang, excursion to Trashi Yangtse Morning visit of Trashigang dzong which was built in 17th century and has commanding view of the valley. Inside are few interesting temples and local government offices. After that you'll take about 2 hours drive time to Trashi Yangtse. On the way, pay a visit to the Gom Kora temple, place where 8th century magician-saint Guru Padmasambhava left his body imprints. Further drive will offer occasional views of snowy mountain in clear weather. Finally you will see impressive building of the old Trashi Yangtse dzong which is home to 300 monks. The dzong used to protect former trade route with Tibet and was established by the saint Pema Lingpa of 15th century. Near the Trashi Yangtse is the famous Chorten Kora, the largest stupa in Bhutan built in Nepali style. This is the site of two colourful local festivals at the beginning of the year. Trashi Yangtse is also home to National Institute for Zorig Chusum, the school where the young people learns the art crafts of their forefathers to keep Bhutan's traditional arts alive. In winter, if time permits, it's also good idea to make detour to Bumdeling birds reserve further to the north as the rare Black Neck Cranes might be spotted here if you're lucky. Evening return to Trashigang. 3 Trashigang – Merak Today you will change the car for hardy Bolero jeep and start early in the morning ascending to high mountains of Merak – Sakteng, so called Migoi national park. Migoi is local name for elusive yeti and most local inhabitants will be able to remember numerous cases when they or they relatives encountered yeti in the wild. After about 5 hours rough road ride you we will reach Mon-la pass where the welcome party of Borkpa nomads in local dress will be waiting. Experience of local hospitality and yummy nomad lunch, the tasty local spirit and milk-like chang beer. Continue drive to Merak village (3500 m) and accommodation in local farmhouse as a guest of Brokpa family. Explore village and witness the performance of Yak dance and then and Aum Yomo (local deity) dance. Sleeping in simple conditions (own sleeping bag is recommended but not necessary). 4 Merak – Tashigang In the morning undertake hike above the village to get beautiful views of the village and Aum Yomo peak. Later after telling goodbye to your hosts in Merak village, take a Bolero again and drive back to Tashigang. If you're early, you can also visit Rangjung monastery, beautiful Nyingma school of Buddhism monastery which hosts number of interesting statues and relics. Enjoy the evening in leisure. 5 Trashigang – Mongar It's just 3½ hours drive to Mongar but it would be a pity not to make a 2 hours detour to Dramtse Gompa, which is one of the most important monasteries of eastern Bhutan. This is the place from where the famous Naga Chham (Drums of Dramtse), mask dance with drums originated. This dance is ubiquitous feature of many festivals and also it was included to the UNESCO list of of oral and intangible heritage. Monastery itself was founded in 16th century by descendants of the saint Pema Lingpa and it's name means "the peak where there is no enemy". There is number of interesting chapels with a lot of important statues of the saints and protector deities. If you're in mood for short hike, you can also pursue 1.5 hour scenic hike from Dramtse to Baging la via Shergang village (currently might not be possible due to road works). Alternative option would be easy half hour hike going downhill from Drametse to Baging village directly. After reaching Mongar, you will pay a visit to it's dzong (castle). Although built in 1930, the dzong maintains Bhutanese architectural traditions. 6 Mongar, excursion to Lhuentse Morning drive to Lhuntse which is one of the most rural and isolated districts in Bhutan. The landscape is spectacular with stark cliffs and gorges, beautiful conifer and pine forests and remote villages with rice, millet and corn fields. Kurtoe region of Lhuntse is the ancestral home of Bhutan's royal family. 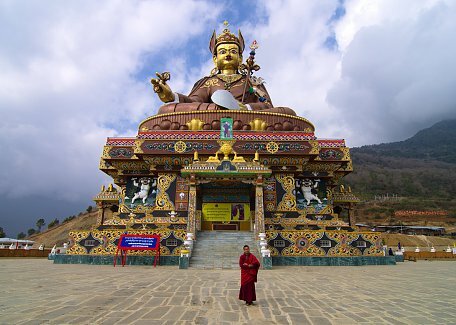 On the way, we will make a detour to Takey la, the place where the gigantic statue of Guru Rimpoche was recently built. Inside the statue, you find number of richly decorated chapels, which belongs to best in Bhutan. Further you will continue to Khoma village for most elaborate traditional cloths in Bhutan. Quality of weaving is so fine that even Royal Family places their order for clothes here. Village itself is interesting and beautiful so we will spend some extra time here having a lunch in local house and tasting local delicacies. Then we will continue to Lhuntse to see a dzong which belongs to one of the most spectacular monastery-castles in Bhutan, with total 7 chapels you can explore. Residing monks have welcoming reputation. Drive back to Mongar. 7 Mongar – Samdrup Jongkhar Today we will undertake full day drive back to Samdrup Jongkhar, reaching there in the late afternoon or evening. Not so much to see on the way, but definitely you would make a numerous stops for photographs. This will be your last day in Bhutan so celebrate the visit with your staff! 8 Back to Guwahati at noon After morning immigration formalities, you will tell good bye to your Bhutanese guide and driver and Indian counterpart will drive you to Guwahati, reaching there before noon to catch ongoing flight to your final destination. Extend hike from Merak to Sakteng village (+1 or 2 days): If you're fond of hiking, this variant crossing through Merak-Sakteng national park is highly recommended. Extend with Omba Nye "The Tiger's Nest of the East" hike (+2 days): Omba Nye is new popular 3 days trekking trail in Bhutan, which can be also done as 2 days / 1 night hiking excursion with overnight in Omba village homestay. The Omba Nye Monastery has stunning setting on the rocky cliff, which is similar to Paro's Taktsang. Start or finish in Paro (0 or more days): Thanks to domestic flight which is connection Yongphula airport in Eastern Bhutan with Paro in the West, you can also conveniently start/conclude the trip in Paro in Western Bhutan, see famous Tiger's Nest monastery and other sights.